Every book I write is about preserving a heritage, because in the present day far too much importance is given to new and exciting things while the past holds a treasure of beauty that is often forgotten. When in Britain I think about the rich food culture so many Brits don’t know their country has, going centuries back and shaped by religious turmoil, invasions and politics. When in my home country Belgium I walk through the streets and everywhere I look I see lost cafés… There used to be a café – or what the English know as a ‘pub’ – on every street corner. Today, they fade, making way for trendy spots which can never capture the essence of a tight knit community. Landlords and ladies who become like mothers and fathers to those who frequent their café. The pictures on the walls telling stories of generations. The history of British Puddings Savoury and Sweet. This is a part recipe book and part food history book, illustrated with beautiful artwork by my husband Bruno Vergauwen, with photographs by me. Many of these historical dishes have never been photographed for a book so it is definitely an exciting work to look at and read. Published in English by Murdoch books in UK, NZ and AUS, and in The Netherlands and Belgium by Davidsfonds/WPG. Pride and Pudding was shortlisted for the prestigious Andre Simon Awards and was a winner for the UK in the Food Heritage category of the Gourmand World Cookbook Awards. In Pride & Pudding, food photographer and writer Regula Ysewijn takes you on a journey through the fascinating culinary history of Great Britain. Hailed as ‘a truly wonderful thing of beauty…a very tasty masterpiece’ by Jamie Oliver, Regula’s Pride and Pudding contains over 80 recipes that give the reader an insight into the life and times of the Great British Pudding in its various sweet and savoury forms. 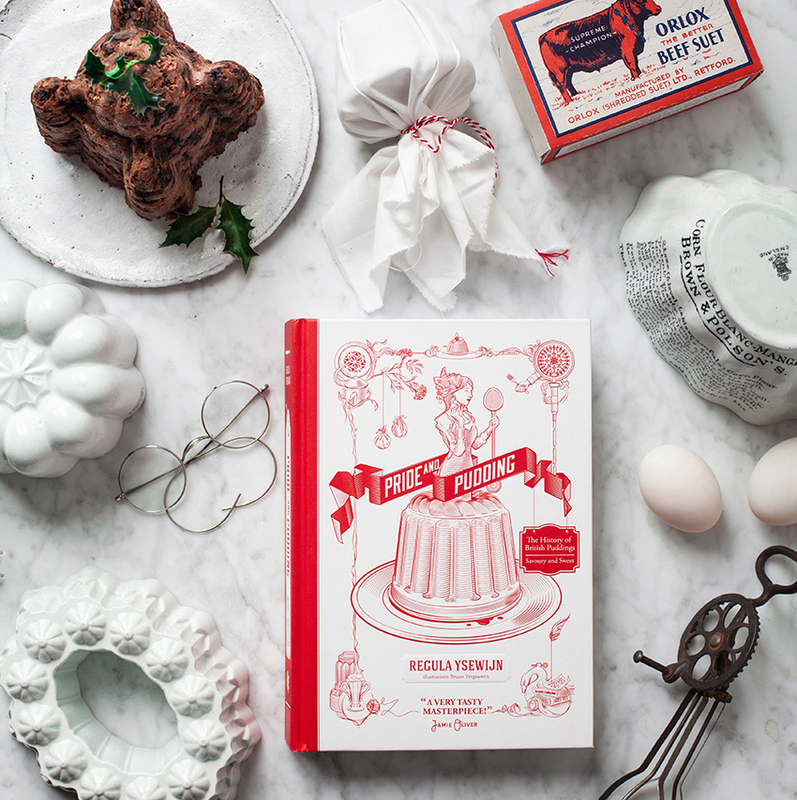 Divided into chapters of Boiled and Steamed Puddings, Baked Puddings, Batter Puddings, Bread Puddings and Milk puddings, jellies and ice creams, Regula’s refreshingly original book traces the history of the British pudding in all its guises as she delves through historical texts dating from the 14th century. With a distinctly gothic-romance aesthetic, Regula recreates the well-known puddings such as Haggis, Black pudding, Bakewell pudding and Queen of puddings, to the lesser known (yet once popular) puddings such as Snake fritters, Cabinet pudding and Mock plum pudding ice for the 21st century kitchen. With stunning photography and fascinating facts along the way (did you know the Jam Roly-Poly was nicknamed ‘Dead Man’s Arm’ due to the custom of it being boiled in an old shirt sleeve? ), Pride and Pudding is a refreshingly different kind of cookbook that’s a must for anybody who delights in British history and British food. Published by Murdoch Books in English (original) and Davidsfonds/WPG in Dutch (translation). You can order a book from the usual places Amazon or Waterstones, or support your local book store. A Portrait of the Iconic Café. This book tells the story of the ancient Belgian café’s. Traditionally Belgian Café’s would be managed by women, because the pubs were often in their homes and the men would go out to work at the factory or on the field while their wives would serve beer to the community. Very few of these traditional Café’s still remain and I have tried to visit them all, capturing them with my camera before they are lost forever, some have recently closed and I was probably the last to note down their history. In the book I will show you the traditional Café world and architecture, and tell you the stories that built the Café into more than just bricks and mortar. Luster Books October 2016 – published bilingual in English and Dutch. (two covers). 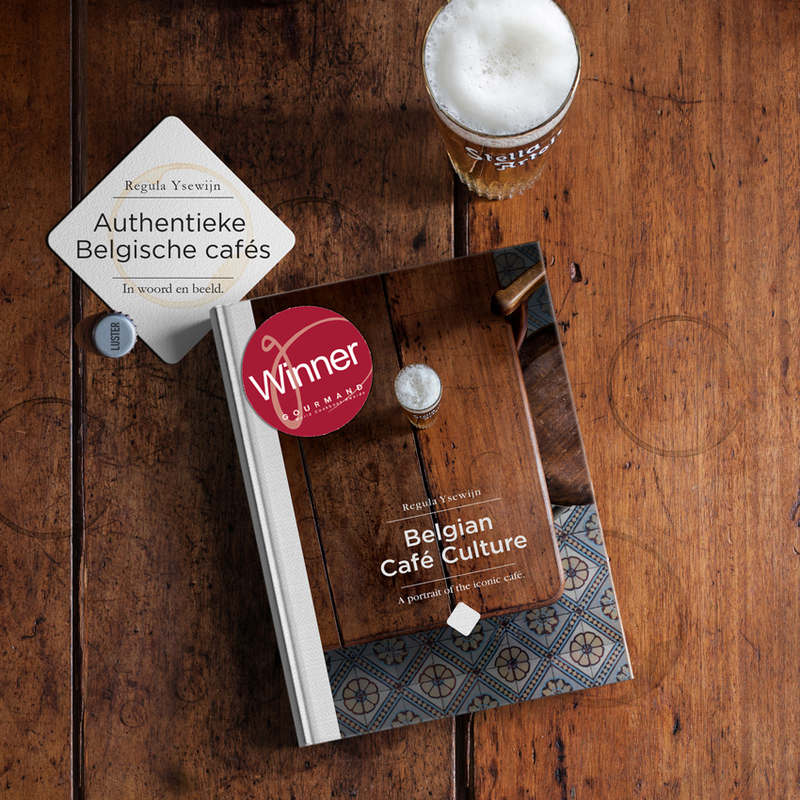 Belgian Café Culture won the Gourmand World Book Award for Belgium in the ‘Culinary History’ category. This book is an ode to Belgium’s traditional cafés, to their landlords and -ladies, and to the regular customers who have become part of the interior. It is also a plea to handle the café patrimony of Belgium with the greatest care. Because we have been taking these little cafés for granted for far too long and now, their existence has become fragile, despite the fact that they are an important part of our social and cultural heritage. Food writer, photographer and graphic designer Regula Ysewijn writes the blog Miss Foodwise. She is also the author of ‘Pride and Pudding’, a book about the history of British puddings savoury and sweet. She’s a true Anglophile, and she often works for clients in London, but she lives in Belgium and cherishes her Belgian roots, in particular the iconic beer and café culture. For this book Regula visited 45 traditional cafés in Belgium. From the oldest café in the country (it opened in 1515) to the oldest Belgian café landlady, Juliette, who is 96. She visited cafés with beautiful Art Deco interiors, and cafés with the charm and warmth of a living room. In each of these establishments she talked to the landlords and -ladies and to the people who have become part of the soul of these cafés, and she managed to capture all of this in beautiful, touching photographs. The limited edition of Belgian Café Culture comes with a signed photograph printed on gyclee art paper. This edition is limited to 50.